Versions of the SpaceIL lander, build by IAI and scheduled for launch next month, will be offered to ESA to carry payloads to the lunar surface under a teaming agreement between IAI and OHB announced Jan. 29. 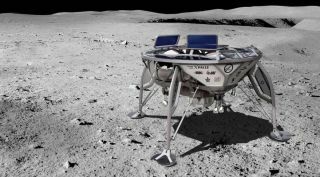 The advantage of this agreement, the companies argue, is that it takes advantage of existing technology in the form of the lander IAI built for SpaceIL. "It's the same lander, modified to take the payloads as required," said Opher Doron, general manager of IAI's space division, in an interview. The lander could take "several tens of kilograms" of payload to the lunar surface, he said. Such a lander, like the SpaceIL mission, would likely launch as a secondary payload on a rocket carrying a communications satellite to geostationary transfer orbit, and from there gradually extending its orbit until it is captured by the moon, setting the stage for a landing. "We believe there are quite a few launch opportunities at very reasonable prices" using that approach, Doron said. "The attractiveness of this proposition is that it is readily available with no modifications and no development," said Marco Fuchs, chief executive of OHB, in an interview. "The time and money should go into development, demonstration and validation of payloads that fly on it." The first such mission using the IAI-built lander could be ready in as little as two years, Doron said. However, the exact timing of such a mission will depend on ESA's plans for lunar missions and available funding, which Fuchs said won't be known until after the next ESA ministerial meeting, scheduled for November in Spain. Marco Fuchs of OHB shakes hands with Opher Doron of IAI after signing a teaming agreement for commercial lunar lander services Jan. 29. "We are in discussions with ESA, but there are no firm agreements yet," Fuchs said. Another partnership, involving ArianeGroup and former Google Lunar X Prize team PTScientists, announced a contract from ESA Jan. 21 to study a proposed lander mission to mine lunar regolith and demonstrate the viability of extracting resources from it. That study contract will last about a year with a total value of several hundred thousand euros. While the IAI-OHB team doesn't have a similar study contract, ESA's Woerner voiced his support for the teaming agreement. "Another brick stone for the Moon Village," he said in a statement about the agreement, referring to his concept for an open architecture for lunar exploration and utilization. "Excellent!" The initial focus of the teaming agreement is on potential work with ESA, but Fuchs didn't rule out extending it to other agencies, like the German space agency DLR. "We believe that ESA is the right place to start," he said. "But in the back of our minds, this is also something to discuss with national space agencies." That partnership, though, will depend on the success of the SpaceIL lander, named Beresheet. IAI shipped the lander earlier this month from Israel to Cape Canaveral, where it is undergoing final preparations for launch, no earlier than Feb. 18, on a SpaceX Falcon 9 whose primary payload is the Indonesian communication satellite PSN-6, or Nusantara Satu. Those final preparations are going well, Doron said. "Everything is in place to go to the moon," he said. "It's an exciting and challenging mission, and we think we're ready for it."